After hearing sporadic over heating issues, I would like to share what fellow MGC owner and 300HP MGC engine builder Chris McGrath recently shared. The hole in the block which the water pumps feeds into the engine often has flashing so extensive that the coolant is restricted by up to 50%. I will also share an anomaly found on the B series cars. Champion SCCA A series engine builder Bill Dierker tells me that fully 90% of the heads he’s seen have a crack between two particular valve guides. The cause is a factory flaw which allows a void to create where air is trapped. The effect of heat on the air pocket results in a pressure crack at that point. The fix is too remove the valve cover and drill and tap the hole. When coolant is added it is allowed to reach the top of the hole and then a threaded plug is inserted. I mention all this as a long round about way of saying that I have long suspected such a problem with the C and the same Mr. McGrath says he too saw this anomaly on a fresh race motor which quickly failed with a cracked head at the right rear of the head. As I explained the issue to the B head he informs me that he is going to try and track down if there may also be the same issue to the C. I’ll share the word once known. I am also offering these new insights to the US C club newsletter. Further to the entire issue of heating and cooling which I have been involved for many years. I am pretty sure its been said before DO NOT REMOVE THE THERMOSTAT in the mistaken belief that it will solve heating issues. I also offer that adding a restructure, in all but an all out race application is likely more waste of resources than actionable solution. The fundamentals of heat exchange are a flow of water through the radiator SLOW enough to allow said coolant to loose its heat to the flow of air. It is the basis of a centrifugal pump - akin to our oil pump. It is efficient at all RPMs providing no more "pump” action than needed regardless of how fast or slow it runs. In addition to the obvious reason for a thermostat, it acts as a restriction to the flow to allow coolant adequate time in the exchanger (radiator with cross flow of air). The MGC by pass serves a couple of purposes not least of which is a certain escape for coolant in the event of thermostat failure - not a wide margin but a margin at any rate. Any attempt to alter the widely successful engineering of coolant flow is candidate for repeated disappointment and further frustration. Now, a fundamental check to the basic radiator unit is to bring the vehicle to operating temps and slide you hand across the cores - up down and side ways - trying to find a "cool” spot. Of course the unit should tend to be hotter on the intake tank and slightly cooler toward the output tank. But across the cores from tank to tank there should be a perceptible sameness to temp. This is NOT an easy task in the C but there are temp sensors which also accomplish the goal. Lastly, if the flashing removal, proper hoses and functioning thermostat are not solving the problem I would suggest topping up the radiator and get the rear end of the car as elevated as possible, determine the highest point on the rear of the engine and open it. If it a hose you have control of only the hose but when its removed the level inside should match the level of the orifice from which its extracted - let's assume the top heater hose would be the highest obtainable resource. Reattach the hose. Now repeat on the front of the car - elevating it as high as possible. Remove the cap and check that the level of water is the same as when you initially topped off. The excursus is to purge as best you can any trapped air. My only other suggestion at this point is purchase of a soldered not epoxied aluminum replacement radiator as offered by a number of speed shops and elsewhere. 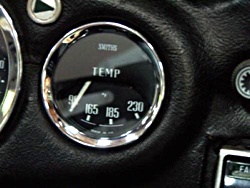 Comments on "Overheating in the MGB and MGC"